I sincerely love this weekly post and link-up, but as you may have noticed recently, I’ve not done a very good job of being consistent at it. With the PCS move and recent changes, blogging has dropped on my priority list. That makes me somewhat sad. 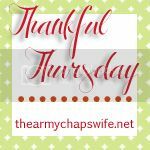 Happily, however, a friend of mine–a fellow Army wife–has offered to host Thankful Thursday for a while! Kay, of Kay’s Little Corner, currently lives in Alaska. Her pictures make me jealous! She is a true encourager and you will be blessed by getting to know her. I would like to apologize to everyone who tried to link up. My website had some hiccups today. The link is now up and I would love to hear about what all you are thankful for this week!! Lisa, this season may appear to last forever with no end in sight. Sometimes it does take months to find that post-PCS groove. I pray that God will walk closely with you through this time and that you will feel His strength!